WayForward is thrilled to be teaming up with Universal Brand Development on “The Mummy Demastered” video game for PC and consoles! 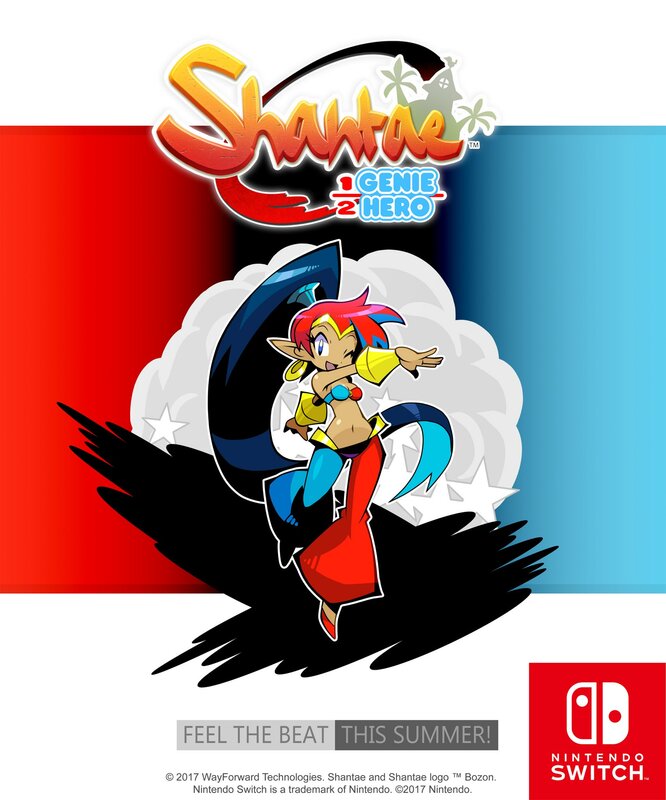 Shantae: Half-Genie Hero is coming to Nintendo Switch this summer! Feel the beat with all new HD Rumble! Full details coming soon!! Announcing a New Re-Imagining of a WayForward Classic! 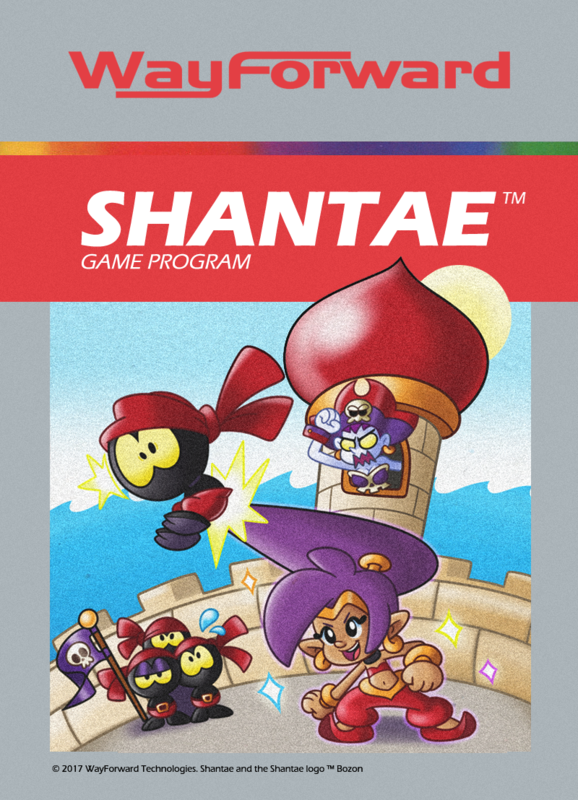 First released on the Game Boy Color in 2002, the original Shantae game sold over 8,000 copies and spawned a generation of diehard fans, as well as several sequel products: Shantae: Risky’s Revenge, Shantae and the Pirate’s Curse, and the just-released Shantae: Half-Genie Hero (all available now on PC Steam and consoles). 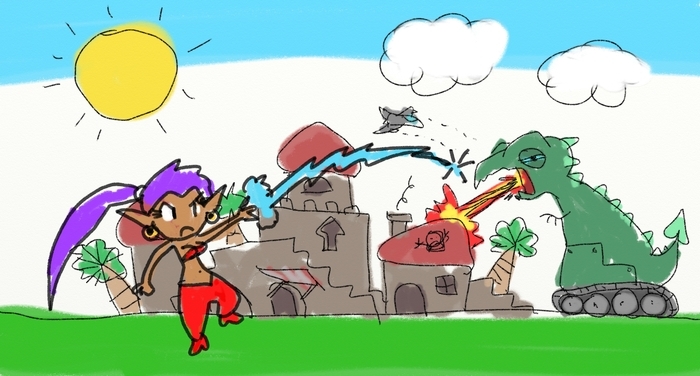 But fans have been asking – nay, BEGGING – WayForward to recreate Shantae’s first adventure for modern gaming systems. Well today, we answer that beg! WayForward has a rich history of recreating classic games with updated visuals, audio, and storytelling. But let’s face it, remakes and remasters are so 2016. What the kids love these days is DE-MAKES! Shantae: Demakeified! is a painstaking recreation of the 2002 Game Boy Color game, with all-new reduced visuals, removed animation frames, and compressed audio! It includes most of the game’s original levels, plus no new content (because we couldn’t fit much on the cart). Gameplay has been redesigned to work with a single-button input, adding a whole new layer of challenge to jumping, attacking, or just walking around. And for people who are “so over” de-makes, there’s a special unlockable mode: Shantae De-Demakeified! Stare with befuddlement at randomly-colored squares that slide around onscreen and might possibly represent characters. Struggle to figure out basic mobility, just like Grand-Dad did back in 1982. More retro equals more fun! Shantae: Demakeified! is available Fall 2017 on all consoles with an RF output. We’re already a month into 2017, and what an exciting new year Shantae is having already! First, a huge thanks to everyone who helped make the launch of Shantae: Half-Genie Hero a huge success! Whether you pledged a lot or a little, helped promote, created content for the game, streamed, or demonstrated patience during the launch period, we want to extend a very heartfelt thank you! Update #100! Reviews, the future and DLC info! RET-2-GO! Shantae’s First HD Adventure! Today is the day! Shantae: Half-Genie Hero, the game to which you have GRANTED LIFE ITSELF is now LIVE all over the world!! It’s SO AWESOME to see so many people enjoying the game that we made together! Reviews are rolling in, fans are going nuts… people are having a great time with Shantae’s newest outing! Remember, if you get a chance – please take a moment today and throughout the week to post or retweet videos, fan art, reviews… or make use of the Fan Kit. Anything you can do to help promote the game is greatly appreciated! Update #97! Holidays, Game Updates & Backer DLC! December 20th 2016 is Shantae: Half-Genie Hero’s launch day! It’s hard to believe that we’re finally there! Yes!! This is really happening!!! So… we’re just going to keep on saying it – THANK YOU for funding this project so we could bring it to life. We made this game together, and it’s time to present our hard work to the entire world! Let’s make LAUNCH DAY a huge success! You can help by making some noise! All of the money you’ve pledged went into game development, not into advertising. So we’re asking every Backer to contribute one more time – not with your wallets, but with your VOICE! Post, retweet, “like” a cool YouTube video, create or support a Twitch stream, or like/link your favorite Half-Genie Hero reviews! Let’s show the world what 22,000 Shantae fans can do! …OR, if you’re feeling really creative, you can use our brand new Fan Kit (http://bit.ly/2i8JpaB) which includes the newest promotional images, screenshots, and backgrounds. Wow, the last two weeks were intense! Backer Code distribution was successful overall, with most Backers receiving codes several days prior to launch. However, there were plenty of cases that needed to be worked out via support email. At this time, there are still people in our support queue. If you’re one of them, we’re dealing with every Backer on a case-by-case basis. It will take some time, but we will get to you as quickly as humanly possible. If you’re a Backer, and have followed the steps listed in UPDATE #94, you’re on our list! If not, please follow those steps to ensure that our support team is aware of the problem! Due to circumstances that are beyond our control, we are still missing 800 Wii U (EU) Backer Codes. We are working hard to get the matter resolved. However, we are concerned that the codes will not arrive before the holidays. We will be on standby throughout the holiday. If the codes arrive we will distribute them the moment they come in. Please be aware that this may not be fixed until after the holiday. Each of you has been sent a complimentary Steam Code for Windows PC so that you can play the game. These codes, which were sent out via Backerkit, are yours to keep. We know this doesn’t solve the problem for many of you. Please accept our sincere apology. The moment Wii U (EU) codes arrive, we’ll send them. You’ve all been incredibly patient. It took longer than expected, but we’re very proud of what we’ve all accomplished together. With launch arriving tomorrow, we want to extend our gratitude one more time. You really made this project what it is. Thank you! Wii U Codes, Press Codes! We have another update for you regarding Wii U Backer Codes. We’ve been sending a lot of Updates lately, so we’ll keep this short and to the point! Wii U North America Codes are here! Codes for Wii U North America have gone out! Hooray! You should all see an email from Backerkit! If you’re having trouble finding your code, please see Update #94 for further instructions! Wii U Europe Codes are still on the way! At this time, the only Backer Codes we’re still waiting for are Wii U (EU). We still expect these to arrive at any moment, but in the interest of serving you best, we’re going to issue each Wii U (EU) Backer a complimentary Steam code to help tide you over. Look for an email from Backerkit, and enjoy this complimentary code while you wait! You are the last group to be served, so thank you for your patience. As soon as we get the Wii U (EU) Codes, we’ll send them out right away! Please note: this DOES include Backers who’ve selected Wii U for Australia and New Zealand. A quick heads up! Now that the majority of Backers have been served, we’re working on the next step, which is to send out Press Codes. This needs to happen this week in order to get reviewers time with the game prior to Launch Day. Don’t worry — Support emails from Backers are still our highest priority! We’ve been working our way through the support list with much success, and if we haven’t gotten to you, we will soon! Remember, if you’re missing your Backer Code for any reason, see Update #94 for instructions on how to get into our support system! Thanks! See you next update! Howdy Backers! This week is all about getting your Backer Codes to you! We already sent the bulk of them out on Friday to get the ball rolling and it looks like most of you have received them. If you haven’t already, now’s the time to locate that email, click the link, and get your Backer Code! Also note that any codes that were time-stamped are now active! Wii U codes for both North America and EU have not arrived yet. We will send them to you the moment they arrive! We expect them sometime this week. HELP! I Can’t Find My Code! Search your email and spam folder for an email from Backerkit. Make sure you’re searching the email account you used to back the project! If you have multiple email accounts, please check them. Your code might be waiting for you! Write a support email with the subject line !!!NEEDCODE!!! We’ll sort our inbox using this subject line in order to give our Backers priority treatment. In the email, tell us your full name, as well as the email address you backed with. We’ll need both of these pieces of information to look up your profile. Finally, please be patient! Most Backers have already received their codes without difficulty, and those of you who are still waiting are are in our queue. Please do your part to help us keep the support lines clear! Emails are being dealt with in the order we’ve received them. Contacting us repeatedly will slow down the process for everyone! Thanks! Thanks, everyone, for your patience while we distribute codes! December 20th is Digital Launch! This is it – the moment you’ve all been waiting for! The digital version of Shantae: Half-Genie Hero now has an official release date of December 20! Happy December, Backers! Here’s some holly jolly news that’s sure to bring joy to your day! DOWNLOAD CODES COMING THIS MONTH! Thanks for your help last week! Everyone’s platform selections are in! We’re now in the process of updating Backer Kit to reflect any changes that we received via support email, which will take several days. Remember, if you never made a selection, we’ve selected Steam for Win PC for you. And with that, the platform selection period is now closed! Update #90 Fun Early Access Surprise!